"A tasty recipe that will make others believe that you spent hours in the kitchen, but only you'll know that you didn't!" Preheat oven to 350 degrees F (175 degrees C). Lightly grease one 13x9 inch baking dish. In a medium saucepan, combine spaghetti sauce mix, tomato sauce, tomato paste and water. Bring to a boil over medium heat then remove from heat and let cool. In a medium bowl, beat the eggs and combine them with the ricotta or cottage cheese, salt, spinach and 1/4 cup of the Parmesan cheese. Spread one half cup tomato sauce mixture into the prepared baking dish. 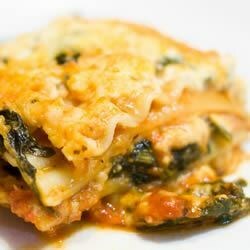 Place half the uncooked noodles over the sauce, spread with half the spinach mixture, half the mozzarella cheese, and half of the tomato sauce. Repeat layers, using remaining ingredients. Top with remaining Parmesan cheese. Cover dish securely with aluminum foil and bake for in the preheated oven 1 hour. Let stand 10 minutes before cutting and serving. I used ricotta cheese instead of cottage cheese, fresh spinach and a premade jar of sauce. The lasagna came out beautiful and yummy. Great lasagna. I used double the amount of cheeses called for and 2 boxes of spinach, along with more sauce. I used the Barilla jarred sauce and the no cook lasagna noodles. My husband loved it. I like the flavour of the spinach in this dish. I used oven-ready lasagne noodles and it worked just as well. Quite yummy! This is soooo good...even tastes great cold! A fantastic way to serve spinach and to treat your vegetarian friends!